A couple of weeks ago on a lazy Sunday I cashed in on a much appreciated birthday gift: cupcake baking classes at Butter Lane Bakery. Butter Lane is a tasty spot just a block away from my apartment. We tend to pop into the shop once or twice a month for a cupcake, and I stop by for $1 icing “shot” every so often if I’ve had a particularly stressful day. The timing was perfect: I would be joining the gym and starting an intense workout regimen the next day, so why not kick it off with some sugary goodness? Also adding to the justification for sugar overload is the fact that the recipes were back to the basics. Yes, there was a lot (a LOT) of butter and sugar in these cupcake and frosting recipes. However, my funfetti-loving self skipped the processed, packaged boxes and made these puppies from scratch, along with a bunch of other ladies and one lone male, my beau. The setup for the class was clean, simple, and cute. 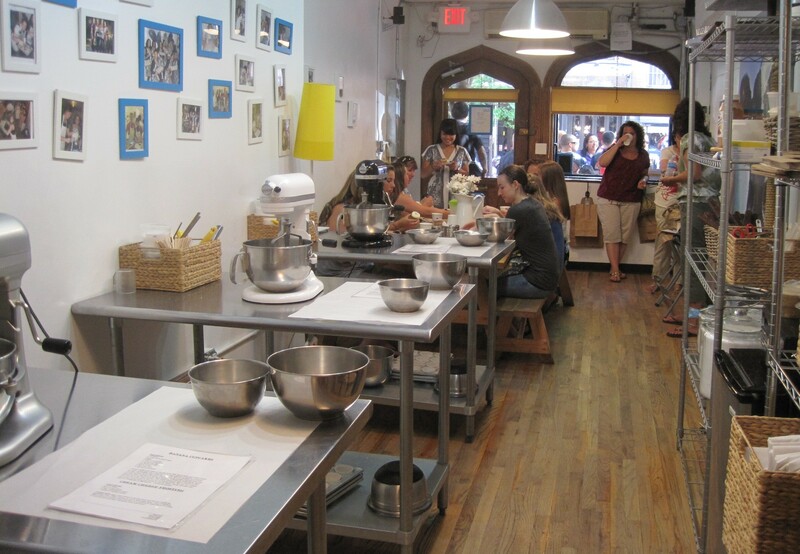 In a long shop perhaps equal in size to Butter Lane itself, there were stations for three types of batter and three types of frosting. After a welcoming mix of Butter Lane cupcakes were served, we formed three teams and got straight down to business. Over some chitchat with our new teammate, we mixed together our pre-measured ingredients. Carefully following our instructor’s directions, we created a light, flavorful batter. One of the secrets? One and a half cups of buttermilk and nearly a cup of cold water in chocolate cake batter. Using an ice cream scoop, we dolloped our flavor of batter into cupcake liners. A few of them were converted into chocolate vanilla swirl, made with a bit of each batter and a toothpick to zigzag around in the pan. The trays were sent over to the bakery next door for a 23 minute bake at 300 degrees. 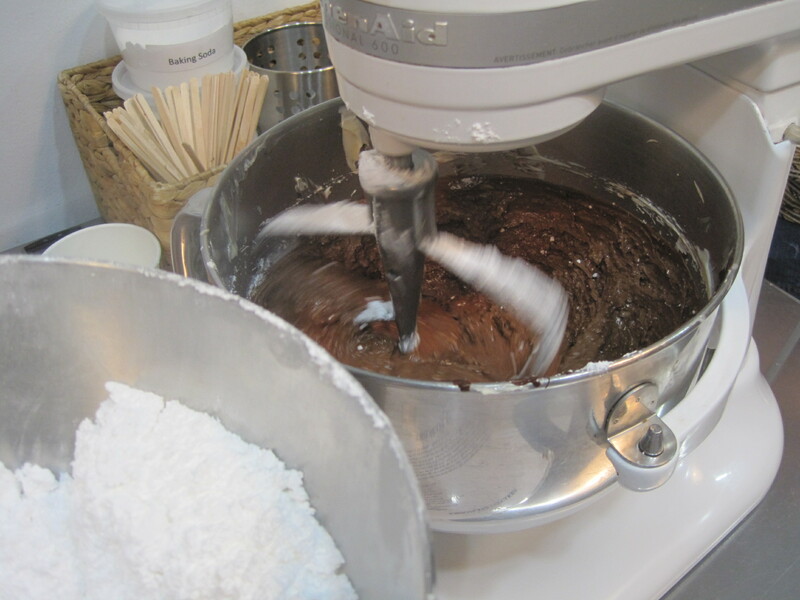 Meanwhile, we whipped up some frosting… literally. 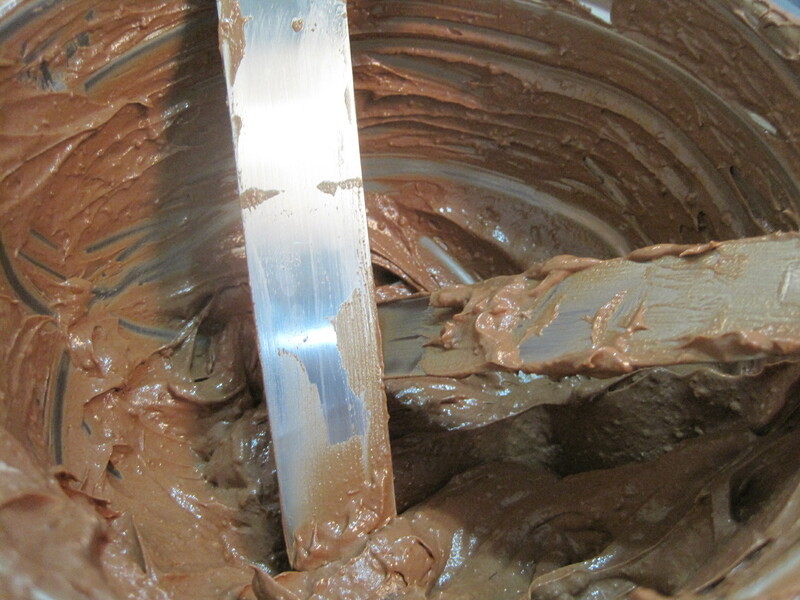 While it was important not to overmix the batter, mixing the frosting is a good thing. 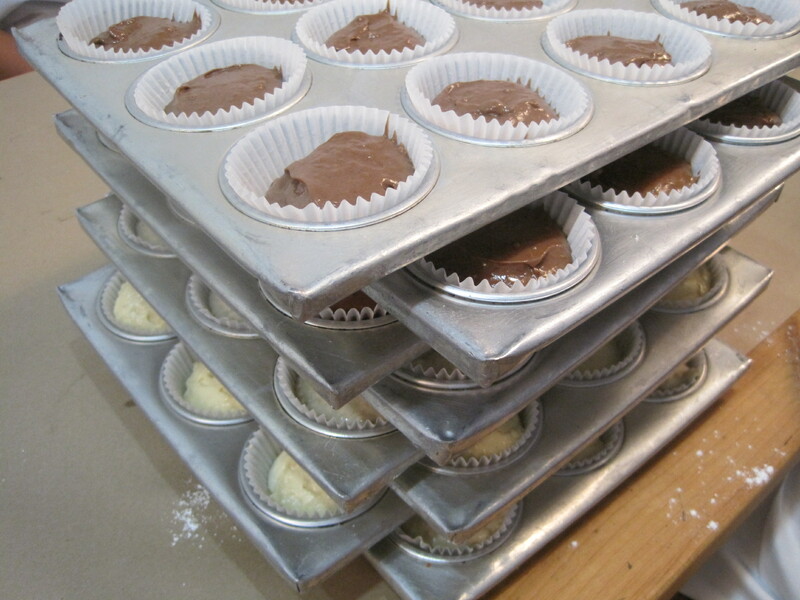 I wish we had a sieve of some kind to get rid of the little lumps in the frosting. For some reason our team didn’t have as nice of a bowl of confectioners sugar as the others because our final product was a bit lumpy. 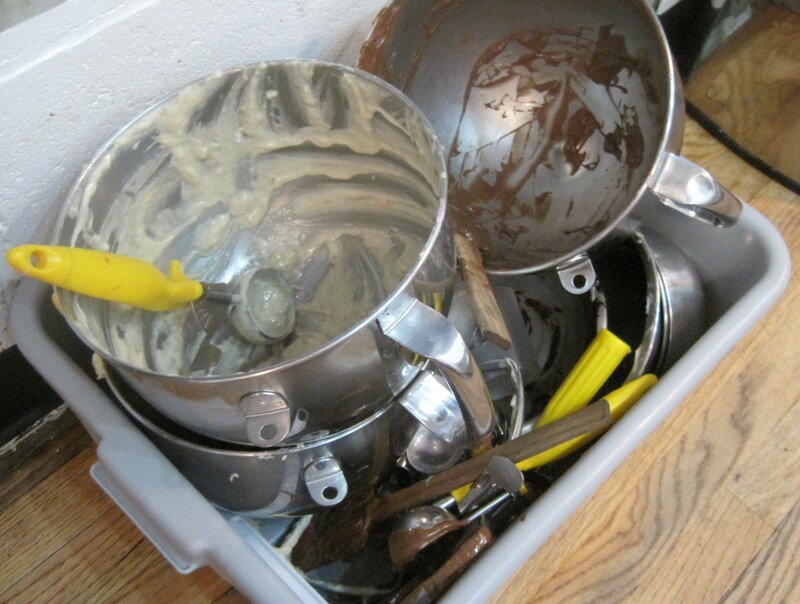 But we enjoyed learning the Butter Lane method of frosting a cupcake just the same, and had a few battles over the frosting bowls. Our cream cheese frosting, vanilla frosting, and chocolate frosting were all tasty, and we created two more types by adding some cinnamon to the cream cheese and some peanut butter to the chocolate. The chocolate peanut butter was definitely a class favorite. Another tip: You can also make some luscious fruit frostings by adding preserves to the vanilla base. Good to know. Our cakes were now out of the oven and cool enough to frost. 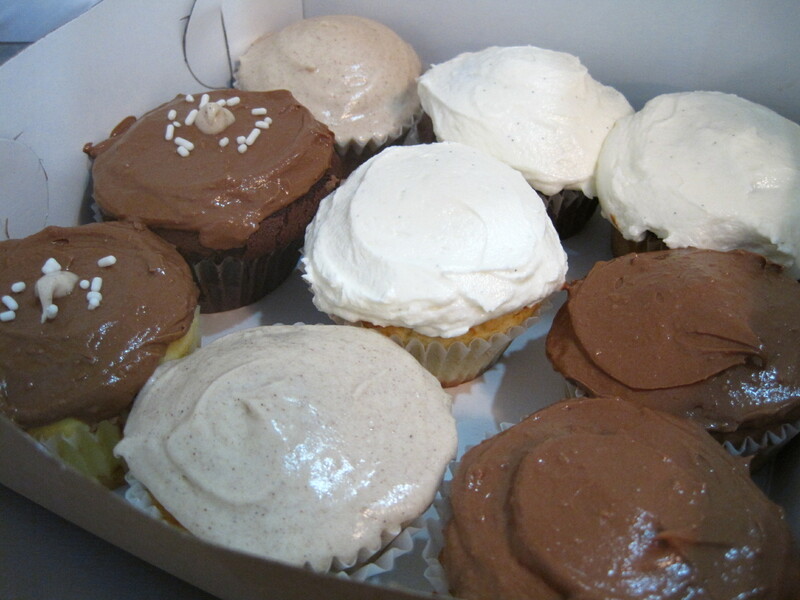 We chose some off the trays and began frosting away, taking home 11 cupcakes each. If you do the math, the cost of 11 cupcakes (plus the one from before class started) from this boutique bakery is nearly the cost of the class! If you’re going to be entertaining for 6 or 7 people (or 15 and you have a friend to take the class with you), why not learn how to make cupcakes from the professionals and score your party desserts? It’s not an advanced class, but it worked out well for novice bakers like us. Even after our Monday night get together, there were still more left over that Mike brought to work the next day. Plus, you won’t have to do any of the dishes! I love cooking classes. What a fun way to spend an afternoon! Your cupcakes look yummy!